Executive Residence 2. This large, tidy 1 bedroom unit is located in a nice development on the Pratumnak Hill area. Building has easy access to the Cosy Beach, mini-marts, restaurants and local taxis. Pattaya City and Jomtien Beach are only a few minutes drive away. This unit features fully fitted European kitchen with oven, microwave, hood, hob and fridge. Also comes equipped with 2 air cons, washing machine and large balcony where you can sit and enjoy the evening breeze and beautiful sunset. Building has 24 hour security, communal swimming pool, fitness room and free WIFI. 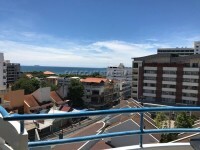 The owner will consider renting the unit fully furnished with a minimum 6 month at 23,000 Baht per month and 20,000 Baht per month 1 year contract. Also available for sale at 4,725,000 Baht with title deed held in Foreign name and tax & transfer fees to be paid by the buyer.